In this file photo, a jaguar watches from her habitat at the Montgomery Zoo in Montgomery, Ala. 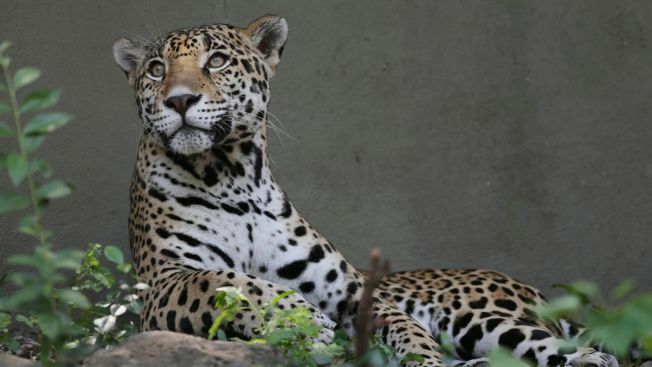 Eight animals have now died after a jaguar escaped from its habitat at the Audubon Zoo in New Orleans Saturday morning. NOLA.com reports an alpaca and fox died Sunday, the day after the male jaguar killed four alpacas, one emu and one fox. The jaguar was captured and returned to its night house after being sedated by a vet team. According to the zoo's website, jaguars are the largest felines in the Americas, and the third largest in the world, known for their powerful bite. "Jaguars will eat almost any vertebrate. Deer, dogs, snakes, fish, horses, turtles, armadillos, mice and birds are all on the menu," the site says.